(although the bar is high, this week was the most devastating for our country). Trump announced he will make major policy announcements via Twitter. Trump’s executive producer credit appeared in the Celebrity Apprentice premiere. Trump sent a divisive, incendiary New Year’s tweet — as opposed to departing President Obama’s warm and generous version. On New Year’s Day, Trump promised a revelation on hacking, either Tuesday or Wednesday. This was a lie — it never came. In a puzzling exchange, MSNBC’s Joe Scarborough tweeted that he spent New Year’s Eve watching tv with his children, until a photo showed him and co-host Mika Brzezinski chatting up Trump at Mar-a-Lago. Trump appointed yet another Goldman Sachs executive to an economic leadership position, this one overseeing markets (SEC Chair). GS stock is up 35% since Election Day. Trump aligned himself with Assange/Wikileaks, repeatedly — despite saying at one point the media was making this up. Trump ally Sean Hannity interviewed Assange for his show. Trump announced his will appoint Pam Bondi, the former Florida Attorney General who received an illegal payment of $25k from the Trump Foundation in exchange for not investigating Trump University, to a top White House spot. Sen. John McCain held a publicly televised Senate Armed Services Committee hearing on Russian hacking of our election. For the first time, Americans got to hear from intelligence leadership. Sens. McCain and Lindsey Graham said they had given up on efforts to push Senate Majority Leader McConnell for a special panel on Russia interference. Trump lashed out in tweets at General Motor and Toyota, causing both stocks to plummet. In the case of Toyota, allegations were false. Trump falsely took credit for jobs at a Ford plant. Ford CEO publicly stated the rationale for choosing the US over Mexico was not related to Trump. WAPO announced the launch of a weekly column on what Trump got wrong on Twitter each week. House GOP took a secret vote to take power over the independent Office of Congressional Ethics. After public outcry and calls to representatives by voters, the plan was scuttled. Trump had tweeted he was for the change, but against the timing. House GOP revived an obscure 1876 rule that allows them cut the pay of federal workers to $1. Trump said he would ask the American taxpayers to pay for his infamous Wall on the Mexican border. Trump promised to downsize intelligence agencies, including the CIA and Office of the Director of National Intelligence, saying both were politicized. Ex-CIA director James Woolsey resigned from Trump’s transition team, saying he did not want to “fly under false colors” any longer. Breaking decades of precedent, Trump said he would recall all Obama overseas envoys immediately on January 20th, before their replacements have been appointed. Trump tweeted his apparent displeasure with the rating of Celebrity Apprentice under Arnold Schwarzenegger, saying he got “swamped” compared to when Trump hosted the show. Report stated that 50 Trump electors were allegedly illegally seated. Rep. Maxine Waters and other Democratic representatives stood to protest, but couldn’t find a single Senator to join them. After meeting with the heads of the DNI, CIA and FBI, Trump continued to deny the Russian hacking, and instead pressed for a congressional investigation of leaks to NBC (something congress doesn’t investigate). Trump said there was no impact on the election. Later that day, an intelligence report was made public detailing Putin’s desire to hurt Clinton and help Trump, and the many ways Russia interfered. The report did not assess if there was an impact on the election (another Trump lie). Trump blamed the DNC and Democrats for being hacked. The intelligence report also indicates Republicans were hacked, although that info was not leaked. Trump continued to side with Wikileaks and Russian, and against intelligence. Even after learning Russia had hacked our election, he called intelligence a “political witch hunt,” and next day tweeted only “stupid” people or fools would think having a good relationship with Russia was a bad thing. 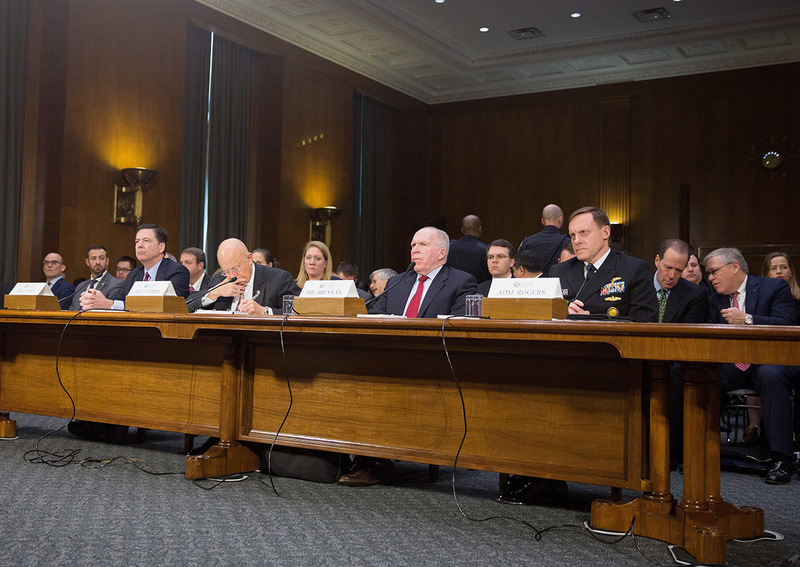 FBI Director James Comey, Director of National Intelligence James Clapper, John Brennan Director of the CIA, and National Security Agency Director Admiral Michael Rogers testified before a Senate Armed Services Committee hearing on Russian Intelligence Activities on Capitol Hill.